One of the important pilgrim centers in the State, Yaganti is situated amidst picturesque natural scenery with caves and waterfalls around. 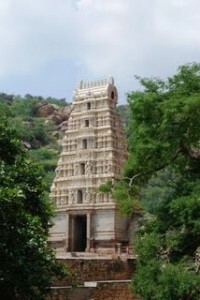 It derived importance from the Yaganti Kshetram containing the temple of Umamaheswara, popularly known as Yagantiswami. The deity of Siva is in the form of a statue. The tower of the temple bears beautiful sculptures. The most striking feature of the temple is the huge Nandi eight feet high. Maharasivaratri festival celebrated here annually attracts a huge congregation. Located 11 km from Banaganapalle, 29 km from Bethamcherla 60 km from Kurnool town. Buses are available from nearby towns. This entry was posted in Andhra Pradesh, Yaganti. Bookmark the permalink.